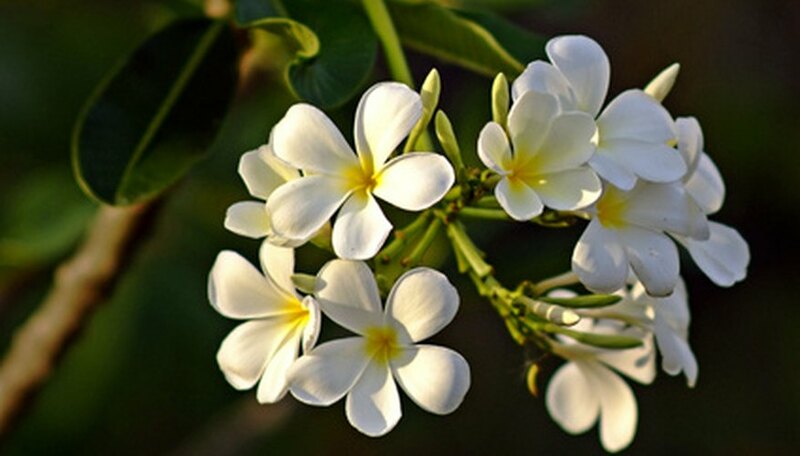 Plumerias are tropical, cold-sensitive trees that bloom in huge, colorful flowers that are often used to make leis. Also called frangipani, plumerias are grown outdoors in the ground in tropical and subtropical regions or indoors in containers throughout other climates. The Singapore white plumeria is a densely-branched tree with rounded, shiny green leaves and 3-1/2-inch-diameter white blooms. The white flowers have yellow centers with wide, rounded petals and a strong lemony fragrance. The Singapore white plumeria originated from Hawaii and is also known as the Singapore obtusa plumeria. Water your Singapore white plumeria deeply to soak the soil down to and around the root area once or twice each week when rainfall is less than 1 inch. If you’re growing the plumeria in a container, water it two or three times per week or when the top layer of potting soil begins to feel dry to the touch. Provide water until it begins to drain from the bottom of pot. Feed your plumeria once every two weeks during spring and summer with a high-phosphorous fertilizer made for flowering plants. Follow the recommended dosage on the fertilizer label. Apply Epsom salts to the soil around your plumeria during spring and summer to provide magnesium. Dissolve 1 tsp. of Epsom salts into 1 gallon of water, and apply this solution when you fertilize the plumeria. Prune your Singapore white plumeria in spring to shape the tree and to remove all dead, damaged or diseased growth. Cut whole branches or stems back to the trunk, or trim back stems to the branch crotch. Protect your plumeria when temperatures dip below 49 degrees Fahrenheit by covering the tree with a blanket or sheet and removing the covering when the temperatures warm up in the morning. If you’re growing a potted plumeria, bring the tree indoors during the fall and winter. Plant your Singapore white plumeria in full, direct sunlight and in very well-draining soil. If you're growing the plumeria indoors in a container, position the tree in bright sunlight, such as beside a south-facing window. You can set the potted plumeria outdoors in full to partial sunlight during the warmer late spring and summer months. Beware of spider mites, mealybugs and whiteflies infesting your Singapore white plumeria, especially if you're growing it indoors. If you detect insects on you plumeria, apply an appropriate insecticidal soap or horticultural oil according to the instructions on the label. Don't over-water your plumeria or plant it in a location with waterlogged or constantly wet soil. Plumerias are extremely susceptible to trunk rot, so don't allow the soil to stay wet and wait until the top 2 or 3 inches of soil dry out before watering the plumeria.